Automatic and high-tech electronic toothbrushes are safe and effective for the majority of patients. 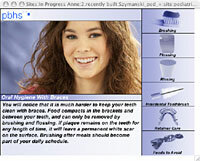 Oral irrigators (water spraying devices) will rinse your mouth thoroughly, but will not remove plaque. You need to brush and floss in conjunction with the irrigator. We see excellent results with electric toothbrushes called Rotadent and Interplak. Some toothbrushes have a rubber tip on the handle; this is used to massage the gums after brushing. There are also tiny brushes (interproximal toothbrushes) that clean between your teeth. If these are used improperly you could injure the gums, so be sure discuss proper use of these brushes with your doctor.